Polio immunization in Nigeria has arguably received more consistent publicity than any other disease. The focus on eradicating polio via immunization has often taken centre stage in global health conversations, so it is clear why for most people immunization is often synonymous with polio vaccination. There is, however much more to routine immunization than eradicating polio. Immunization is a comprehensive package designed to protect children and adults against certain killer infectious diseases. At birth, a child is first given the Hepatitis B vaccine which provides immunity from the deadly viral liver infection. Thirty days later, the child receives the second dose of the same vaccine along with other vaccinations such as Rotavirus, Influenza, DTaP for Diphtheria, Tetanus and Pertussis, Pneumococcal and the Inactivated Polio Virus (IPV) Vaccine. This schedule is meant to continue until the child becomes a teenager and receives the Meningococcal vaccines. The World Health Organisation (WHO) notes that besides clean water, no other intervention has been able to reduce the disease burden in the world like vaccines have. Unfortunately, not all children in Nigeria receive immunization services due to factors such as cultural beliefs and not all are born in health facilities. So they may miss out on getting their first shot which may prompt the parents to follow-up on subsequent doses. In Nigeria, only 35% of births are attended to by skilled health personnel. In 2017 WHO reported that 77% of children between the ages of 12-23 months in Nigeria have not received all the routine vaccination recommended by the country's Expanded Program on Immunization. Borno State, one of the three North-Eastern states currently recovering from an insurgency, surprisingly has better immunization coverage numbers than several other states in the country, including states not under conflict. A Multiple Indicator Cluster Survey (MICS) released by UNICEF and the National Bureau of Statistics (NBS) shows that the state has a 47.7% immunization coverage rate, higher than any other state in the North-East (Adamawa - 37.9%, Bauchi - 18.5%, Gombe - 25%, Taraba - 16.4%, Yobe - 8.7%) and several other states, including Niger at 20% and Bayelsa at 42.6%. Even though the figures fall well below the 90% target set by Nigeria, it is still a commendable statistic in light of the humanitarian situation in the state. Officials in the state are aware of this development, as confirmed by Dr. Sulaiman Meleh, the Executive Secretary of Borno State Primary Healthcare Development Agency. "Immunization coverage, antenatal care and skilled birth attendance indices are things we are tracking over the years and they are improving," he said. Borno's immunization effort is supported by multiple humanitarian organizations working in the state. Some of these organizations have set up clinics in and around the IDP camps in the state capital, Maiduguri. In the Bakassi IDP Camp for example, a UNICEF clinic provides comprehensive immunization coverage for children living in the camp. As a result, children such as 19-month-old Balkisu are able to access vaccinations, and that has helped prevent common infectious diseases. At the Mallah Kachalla Primary Healthcare Centre, UNICEF has set up a Community Based Management of Acute Malnutrition (CMAM) Centre to provide immediate intervention to malnourished children. The centre also provides immunization services to the children. "Majority of the children brought here have not been vaccinated before," Barma Adam Umar, a CMAM Centre officer says, adding, "Aside malnutrition, many children present with measles". Measles can be prevented with the MMR (Measles, Mumps, Rubella) Vaccine, and the first shot is given when the child is one year old. The CMAM centre uses Voluntary Community Mobilizers (VCM) to remind parents about their child's next immunization appointment. "We use the VCMs to make sure they bring the children back for immunization, and from time to time we send them to the address the parents give to remind the parents", Amina Abubakar Mohammed, an immunization officer at the centre, says, adding that between 25 and 30 children are immunised every day at the Centre. The use of Volunteer Community Mobilisers has proved overtime to be an effective tool in many healthcare interventions across Nigeria. In Kaduna State for example, VCMs are not only helping out in immunization, but also advocate for antenatal care and assist in birth registration. In Lagos, the use of VCMs made significant impact during the immunization campaign in Otodo Gbame Community earlier this year. In Kebbi and Kano States they were also utilized in 2012 to help with the polio eradication drive and considered change agents. Some development partners have organised them into networks, recognising their key roles in increasing demand for vaccination, especially in rural and hard to reach areas. At Gubio Road IDP Camp, a clinic owned by Konduga Local Government and supported by UNICEF uses the services of female Volunteer Community Mobilizers who are also IDPs and residents of the camp, to promote immunization coverage in the camp. Because they are women, these VCMs are able to access every apartment in the camp to sensitize parents about immunization and antenatal care. Jummai Mohammed, one of the VCMs, says special attention is given to pregnant and breastfeeding women, and says she visits at least 10 houses every day and on immunization days, she and other VCMs split themselves into groups and make sure they enter every house to mobilize women and their children to the clinic. "Through their work, the VCMs have made women in this camp more aware of the childhood killer diseases", explained Madam Christiana Peter, an immunization provider at the Gubio Road IDP clinic. She said every child from zero to 11 months and a majority of the under-5 children in the camp have immunization cards. 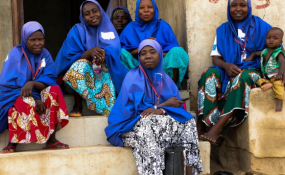 At the clinic she attends to 27-year-old Fatima Abubakar, a mother of five children, who is here to immunize her three-month-old baby Muhammed who was also born at the clinic. Fatima has given birth to two of her five children in the camp and said they are the only ones among her children to receive any form of vaccination. "My three other children never received vaccination because I didn't know it's importance", she said. "When I came here, I was told by the women who visit us that it protects children from diseases.". Madam Christiana says the clinic vaccinates up to 20 children daily but adds that because they do not have a fridge to store the vaccines, they rely on ice boxes to keep the vaccines viable. This means they can only pick up small supplies of vaccines from the Local Government office, and as a result they run out of supplies faster than they should. There is no doubt that Volunteer Community Mobilizers play a huge part in improving immunization coverage in the communities and IDP camps in Maiduguri. However, there is no clear system through which their work can be measured. Understanding how they carry out sensitizations in people's houses will help in ensuring that they pass accurate information. Also, having them in a unit under the supervision of community health extension workers could improve the coordination of their work. According to the WHO, about 5.6million children under five died in 2016, with the most deaths occurring in Africa. Death among children under five is generally as a result of the six childhood killer diseases, the majority of which can be prevented through vaccination. Increasing immunization coverage in Nigeria will lead to a significant reduction in child mortality and the use of community mobilizers as evidenced in these two health centres in Maiduguri has encouraged more families to embrace the practice of immunization. To improve her immunization coverage rate, the Borno state Government can complement the efforts of humanitarian organisations such as UNICEF, by giving the VCMs a sense of belonging through integration and training. At the end of the day, they are the ones that are closest to the people, and their work will in the long run, bring Nigeria closer to protecting its children from killer childhood diseases.